The existence of a given metal in two or more stable but different crystal structures is known as allotropy. The essence of allotropic transformations is that the atoms of a crystalline solid are converted from one crystalline form to another, i.e., then form a new crystal lattice. Modifications, stable at lower temperatures, are designated by the Greek letter α (alpha); β (beta) designate second form of the same material that is stable at some higher temperatures: γ (gamma) at still higher temperature. Allotropy of iron is of special importance. Pure iron is relatively soft and ductile and its melting point is 1539°C . Iron exist in two allotropic forms: α-iron with a body centred cubic lattice, stable at temperature up to 910°c and γ-iron, with a face-centred cubic lattice, stable in the range from 910°c to 1400°c. In the case of oxygen, there are two forms: 'normal' dioxygen (O2) and ozone, or trioxygen (O3). These two allotropes have different molecular configuations. More commonly, allotropy occurs because of different crystal structures in the solid, and is particularly prevalent in groups 14, 15, and 16 of the periodic table. In some cases, the allotropes are stable over a temperature range, with a definite transition point at which one changes into the other. For instance, Tin has two allotropes: White (metallic) Tin is stable above 13.2°C and grey (non-metallic) Tin is stable below 13.2°C. This form of allotropy is called Enantiotropy. 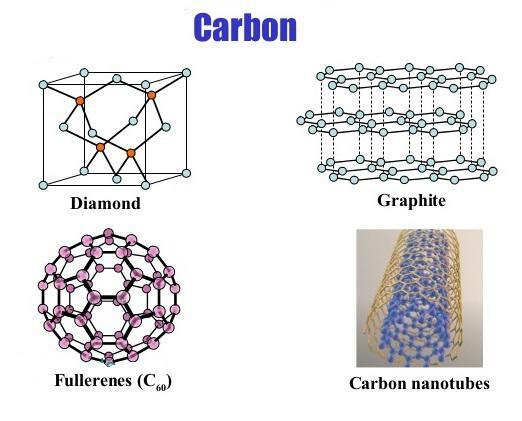 Carbon also has two allotropes - Diamond and Graphite - although graphite is the stable form at all temperatures. This form of allotropy, in which there is no transition temperature at which the two are in equilibrium, is called monotropy.